It has been the “year of video” for at least 6 years now in the marketing world. But 2017 really might be the year when nonprofits should take note when developing their outreach and communications plan. Of all time spent on online activity, 33% is spent watching video. That is an amazing number. Clearly video communication and storytelling is here to stay, which makes it an even more important tool that needs to move to the top of your tool kit. 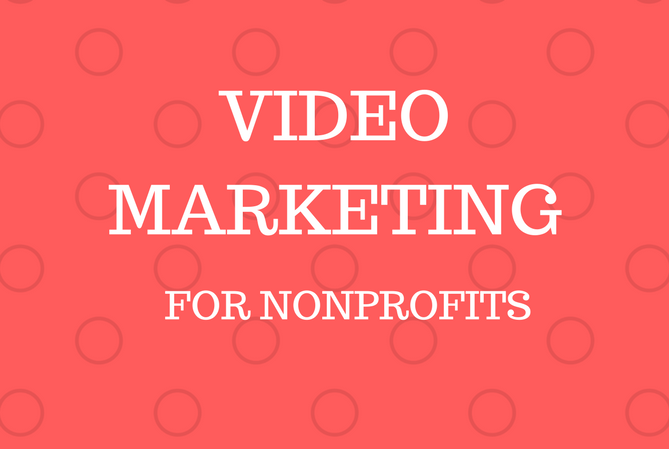 Nonprofits can really take advantage of this and look for opportunities to use video to connect and communicate with your community for both outreach and fundrasing efforts. Here are five ways your nonprofit can use video this year to take your communications to the next level. Live streaming really came into its own in 2016 and looks to continue growing for 2017. Live streaming can offer a powerful and authentic way to show viewers your nonprofit's mission. It is a way to immediately engage with your community and receive instant feedback. It is a great way to offer your organization's unique perspective on the world and communicate on the fly whether it be an AMA (ask me anything) session or an event announcement. All the major social media networks offer live streaming. Facebook Live took off in 2016. However, the network you choose to use should depend on where the people you want to reach hang out. ECHO, Leahy Center for Lake Champlain in Burlington, shares quick little live videos of the happenings at the museum. I can't wait to visit their butterfly exhibit. Email marketing continues to be very relevant for nonprofit organzations and consistent email communication is integral to a successful outreach campaign. To survive and stand out from all the others, you want a solid content game to keep things fresh and interesting for your community. In 2017, consider adding video emails to your toolkit. Emails with video increase your email open and click-through rates. With a user base of 400 million people, Instsgram has the most engaged community with 60% of users logging in everday (source.) According to Bloomberg daily video views in snapchat jumped from 2 billion in May 2015 to 10 billion a year later. Temporary content has increased tremendously in popularity and can't be ignored when reaching out to the 18-34 year old community. With consistent posting and creative storytelling, nonprofits can use the emphemeral nature of temporary video to offer 'can't miss' daily viewing. If you already using Instagram in your social media strategy, consider incorporating Instagram stories to give another view of your organization. Celebrate your donors and community, give a day-to-day view of why you are there. Why not send out personal and public shout outs to community members? Record a quick thank you, telling your donor of the week how much you and the team appreciate them. Just because temporary content disapears doesn't mean it isn't an effective way to connect. We've covered a few different ways to use video. Now I'd like to focus specifically on video content. Comedy isn't for everyone. Comedy is hard. For nonprofits with a very serious mission, you may not want to produce broad comedic videos. Your current messaging may not include a comedic bent. Using humor only works if it is appropriate for your mission and done properly. However, that doesn't mean you can't make people smile with your content. Whether you want to produce a video that gets a huge laugh, a warm smile or an amused smirk, humor can be a very effective technique in storytelling and building emotional connection. Chittenden Solid Waste District produces videos that focus on awareness and education. Some are quirky and fun. How else are you going to learn how to recycle a pizza box? Have you considered if some of the videos you posted to your organization’s social media networks might work silently? During the 3rd quarter of 2016 - 52 percent of all video views came from mobile devices. With the popularity of mobile your video can be viewed anywhere, including places and times where where audio is not appropriate. Give people the option of watching a video anywhere and then sharing it. News organizations do this well. The Burlington Free Press posts news updates on Facebook using silent video. With all of the video uploaded on a daily basis and shared, it can be challenging to stand out from all the clutter. Producing video of quality takes time, focus and resources. Your budget doesn’t need to be at a feature-film level. You just need to value the process and put effort into the storytelling. In honor of February, this video shows you the power of a love letter. If you have never produced video for your organzation, now is the time to develop your strategy and make a video. If you currently have an active video strategy, take the possibilities above into consideration as you develop new videos. You never know when you'll hit on something that will connect with a new audience. The key to success is always authenticity and creativity. If you aren't sure where to start ask yourself "What are the questions that our community imembers ask us?" Start your video there. You never know where the answers may lead.